Spain and Italy. The football that for years masters at European and world level dominating the game and annihilating the opponents with the beautiful game against the physical and tactical football that is instead trying to get up and to take back a starring role as in the past. Induced football that for years builds young promises and produces thick players who finds himself opposed to an environment all to rebuild that in recent years is making a lot of effort to plan the future. All in all, however, something in recent times is changing and the peninsular environment has become aware of its limitations by seeking new ideas and giving a semblance of programming for the future. At European level we have also arrived at some finals conquered with strength and merit of the talents put in beautiful show but above all accumulating international experience. Although the predictions may be unfavourable, nothing can be taken for granted in the double challenge between Spain and Italy, Real Madrid against Juventus and Barcelona against Rome, which will be played in the next few weeks in the Champions League. Real Madrid: It is a compage of particularly offensive character that alternates a deployment in 1-4-3-1-2 to one in 1-4-3-3 depending on the presence in the field of the talented attacking Isco to act as a trimmer behind Ronaldo and Benzema or the use of Fragile Welsh Bale as a right winger to do department with the latter two. In Both cases the Madrid propose an offensive kick with an alternate start maneuver by the Navas goalkeeper to seek the construction of the game from the bottom or the verticalization on the offensive terminals overcoming possible ultra offensive pressing Opponent. 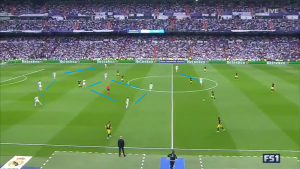 In General The game of Blancos focuses on the external lanes starting from the direction of Modric and Kroos with a particular predilection for the left out. In this area it tends to open up Ronaldo who, working in combination with Carvajal in overlap and Kroos in support, generates numerous opportunities for goals. The Portuguese is a player endowed with imposing physical structure, change of pace and an out of the ordinary talent that creates situations of numerical superiority from won duels or invents finishes in favor of the companions anticipating the movements. In key realization is the man more than Real creating and realizing most of the offensive developments in the last third with a technical baggage that I see it prove equally dangerous both from the distance and as a rapacious area. The Madrid are a particularly dangerous compage even on the inactive being able to count on a sharp jumper, quick and effective in the air game as Sergio Ramos, author of several decisive markings. Juventus: Has approached this season with a summer market rather troubled because of the not unclear sale of the leader Ballard to the rivals of Milan. The company tried to make available to the technician the best possible by purchasing the performance of Howedes, Matuidi, Douglas Costa and Bah in order to have alternatives also in terms of game system. In Europe the Bianconeri alternate between a 1-4-3-1-2 of containment and a 1-4-2-3-1 unprejudiced in terms of offensive interpreters not always dedicated to the phase of non-possession. The rose ranks among its ranks players of world caliber and proven experience as Buffon, Chiellini, Barzagli and Higuain but has its lighthouse in the play of inspiration of the young Dybala who, alternating in the position of attacking and second toe, shows skill In the individual duel, in the finishing in favor of the comrades and especially in the finalization in dynamic developments but also by idle ball. Feature not to be underestimated of the young Argentine is his remarkable tactical intelligence that leads him to be mobile all over the offensive front and move in the intermediate spaces offering passing solution under construction but also possibility of attacking The areas less manned by the opponents in a short time. Juventus tends to develop game starting from the external lanes with Douglas Costa/bah and Mandzukic, but it must do without the speed and effectiveness in the duel of the injured Cuadrado. All of the game of Turin then focuses in the last third in the search for wall combinations with Higuain or his search by external finishing for finalization in the game plane. Spain and Italy does not end here, Monday, April 2, we specifically analyze the challenge between Barcelona and Rome. This entry was posted in LFScouting, News and tagged barcelona, real madrid, Spain. Bookmark the permalink.